A screenshot of a video shared on White House social media accounts. The video — a fake movie trailer encouraging cooperation between President Trump and North Korean leader Kim Jong Un — was shown to Kim by Trump himself on an iPad toward the end of their summit in Singapore Tuesday. The video — extolling the virtues of international cooperation between President Trump and North Korean leader Kim Jong Un — was shown to Kim by Trump himself, on an iPad toward the end of their Tuesday summit in Singapore. The video consists entirely of rapidly edited stock footage (Clouds! Power lines! City at night! Orchestra! Little girl in wheat field at sunset!) while a narrator extols the virtues of international cooperation and lays out the grim consequences of its absence (Missiles launching! Empty store shelves!). Rhetorical questions are asked. Superlatives unleashed. "The light of prosperity and innovation" gets a shout-out. Ditto "the light of hope," which, much like the light of prosperity and innovation, "can burn bright." I asked NPR National Security Correspondent David Welna to help me determine whether the video sheds any meaningful light on the two world leaders who figure so prominently in it, and what it may suggest about the Trump administration's approach to foreign policy. Glen Weldon: David, I'll kick this off by noting, as a movie critic, that this trailer is ... pretty lousy, as trailers go. The narration is ham-fisted, repetitive and riddled with clichés and there are shots that just leave you staring, mouth agape. What's your take on it, on a purely aesthetic level? David Welna: This strikes me as a kind of storybook fable, with lots of pictures. It's a mashup of images in striking colors of a world of cars, crowds, postcard landmarks and then Trump and Kim themselves, shown in commanding shots. Then it all gets dark and nasty, with black-and-white shots of soldiers, warships and a menacing jet fighter. The message seems to be, "That's the world you'll be stuck with, pal, if you don't make the right choice here." Then, as if that right choice had been made, we see missiles launching in reverse, the rockets sucked back onto their launchpads, along with images of bright skies. "The future," the narrator concludes, "remains to be written." Weldon: Is it possible to glean anything from the Trump administration's thinking here? I mean, clearly Trump assumed this approach — promises of prosperity, etc. — could sway Kim. Will this leader choose to advance his country and be part of a new world? Be the hero of his people? 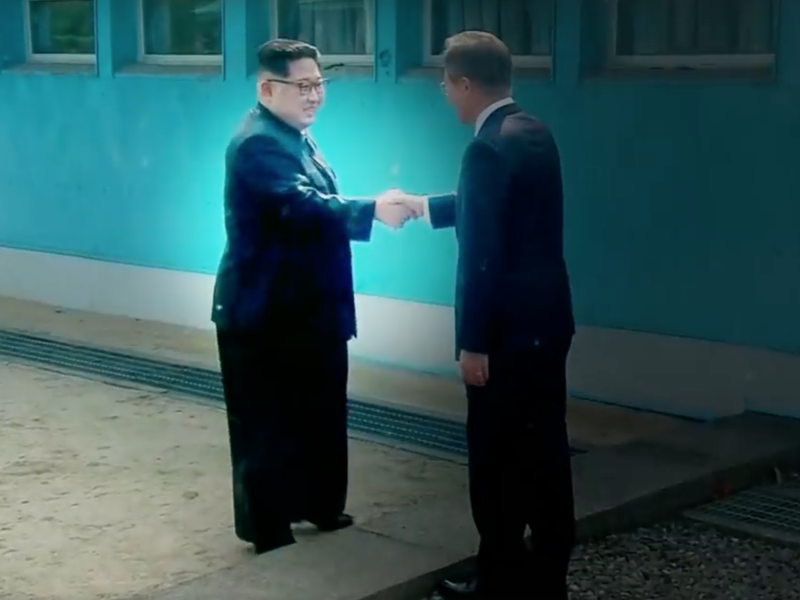 Will he shake the hand of peace and enjoy prosperity like he has never seen? A great life? Or more isolation? Which path will be chosen? Weldon: It's propaganda, and certainly the U.S. has a long history, through entities like USAID and Voice of America, of producing content that promotes the American way of life. How does this odd thing slot into that history, if it does at all? Welna: It does feel a bit retro — Trump even referred to it as a "tape." This is good, old-fashioned government advertising reformatted for the digital age. The video's opening shot has the words "A Destiny Pictures Production" superimposed on the image of a turquoise mountain lake. But this is, in fact, a product of the White House's own National Security Council, "to help the president demonstrate the benefits of complete denuclearization, and a vision of a peaceful and prosperous Korean Peninsula," as an NSC spokesman put it. In intelligence and military circles, this video might be seen more as a psychological operations, or psy-ops, maneuver — a selection of images and information crafted to influence emotions, objective reasoning and ultimately the choices people make. Weldon: The odd thing — well, one odd thing — is that the kind of trailer it's imitating hasn't been made in a decade or so. That "voice of God" narrator has gone the way of the dodo. As your editor mentioned, it feels a lot more like a Trump real estate video, right? Welna: There certainly is a Trumpian feel to the video, though we don't know how much of a hand he had in it, if any. But if you listen to a promotional video Trump did with his children Ivanka and Eric a few years ago to sell units in a Trump Tower being built in Manila, there's that same bombastic, superlative-heavy tone. Weldon: Is it possible that Trump might be projecting here? That this kind of gambit is something he'd find appealing, or convincing, so he figured it'd work on him. Does that scan? Welna: That's entirely possible. Trump seems endlessly transfixed by TV, especially when he's the topic, and this video gives double billing to Trump and Kim as the leading men. Trump also seems to believe in the magic of envy, of making people want something they don't have because someone else has it. In this case, it's the promise of the wealthy world showcased by the video. Whether Kim's going to be swayed by any of that, of course, is another question. His vice minister of foreign affairs put out a nasty statement last month belittling the U.S. for thinking North Korea would ever trade its nukes for American economic support. Weldon: Are you looking forward to seeing what's next? Trailers for Trade Tariffs: The Movie? Or Tax Reform 2: The Secret of the Ooze? Welna: Perhaps one whose target is closer to home: Mr. Mueller, the Time has Come to Choose. Toward the end of the summit in Singapore, President Trump showed Chairman Kim Jong Un a video created by White House staff. PRESIDENT DONALD TRUMP: He looked at that iPad and I'm telling you, they really enjoyed it, I believe. CORNISH: It's now posted on the White House Facebook page and kind of looks like a trailer for a movie that does not exist. The message - North Korea can choose future prosperity or nuclear weapons but not both. It was an unconventional thing to do at a summit. So unconventionally, we invited our national security correspondent David Welna and culture critic Glen Weldon to offer their observations. GLEN WELDON, BYLINE: Hey, David. DAVID WELNA, BYLINE: Hey, Glen. WELDON: So this video is, I think it's safe to say, unsubtle. UNIDENTIFIED PERSON: Seven billion people inhabit planet Earth. WELDON: Here's what it looks like - a bunch of stock footage of at first very positive things - clouds, orchestra, a little girl in a wheat field, Machu Picchu, for some reason. UNIDENTIFIED PERSON: A new story, a new beginning. WELDON: A then it's contrasted with images that we are to infer would result if Kim made the wrong choice - an empty grocery store, an abandoned bike, American missiles launching. WELNA: This really is kind of a storybook fable. It shows both Trump and Kim in very commanding poses. And then it holds out this glorious ending. UNIDENTIFIED PERSON: One moment, one choice - what if? The future remains to be written. WELDON: So we should talk a little bit about where it came from. WELNA: Right. It's labeled as coming from Destiny Pictures. But that's actually a production company in Los Angeles that had nothing to do with it. In fact, it was the National Security Council that finally admitted having commissioned this film. Exactly who made it, we still don't know. WELDON: So can we look at this and glean anything at all from the Trump administration's mindset in kind of creating this video? WELNA: Well, you know, I think Trump the developer really comes out here. He, in fact, made a video a few years ago with his children Ivanka and Eric selling the Trump Tower in Manila. And what you hear from that video really is kind of a rough draft of what we heard from Singapore. ERIC TRUMP: Very tall, very chic. D. TRUMP: This is going to be something that people love, that people respect as a structure. WELDON: Yeah, it does sound a lot like that real estate marketing video because speaking as a film critic now, it doesn't really feel too much like a trailer that's been made in the last 10 years. We've lost that voice of God narrator in trailers for a long time. UNIDENTIFIED PERSON: It comes down to a choice on this day, in this time, at this moment. WELDON: You know, it's very bombastic language, like the light of prosperity and innovation has burned bright and there are doors of opportunity. UNIDENTIFIED PERSON: Will he shake the hand of peace? WELDON: It's propaganda, not really a film trailer. WELNA: But it's also, I think, something that we might call psyops, psychological operations. This was something that was done in the military and intelligence for many years, showing selected images and information to influence emotions, objective reasoning and ultimately decision-making in the people who see these things. Now, whether Kim might be swayed by all this is quite another question. Just last month, his government put out a statement saying the U.S. was trumpeting economic compensation if North Korea abandoned its nukes. And it then said we have never had any expectation of U.S. support in carrying out our economic construction and will not make such a deal in the future either. WELDON: OK, so what is next? Is this a one-off thing that they did or is this a trend? Are we looking at trailers for trade tariffs, the movie or tax reform, too? WELNA: Or perhaps a longer title - Mr. Mueller, the time has come to choose between a witch hunt and a full and total clearing of my name. WELNA: That's NPR culture critic Glen Weldon and national security correspondent David Welna. Transcript provided by NPR, Copyright NPR.